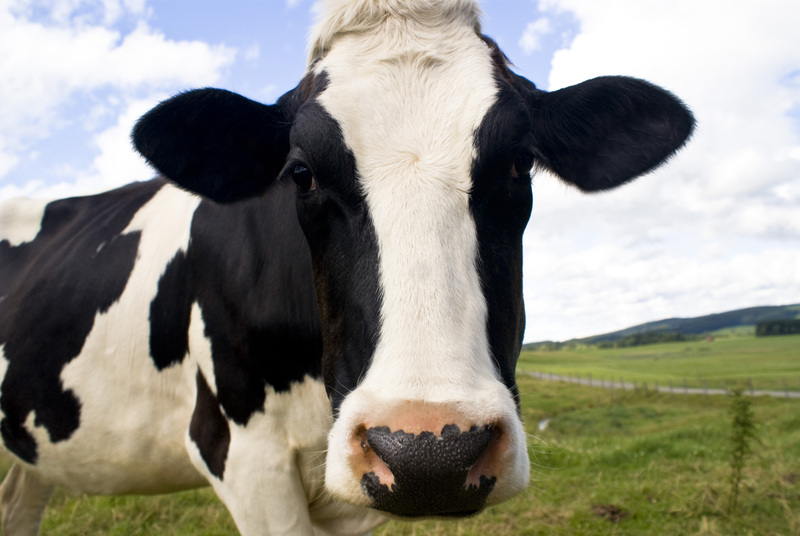 It may be impossible to tip a spherical cow. But by searing one on the computer, scientists may have found the best recipe yet for transforming proteins into crystals. Crystallizing a protein is not as simple as throwing it in the freezer and letting it chill, the way liquid water turns to ice. “We would like to know what is going on at that fundamental level when we crystallize a protein. But we don’t,” said Patrick Charbonneau, an assistant professor of chemistry, physics and computational biology at Duke. But by looking at each protein as if it were a spherical cow with sticky patches, Charbonneau said scientists could learn more about the standard set of interactions that transform proteins from a liquid solution into crystals. “Physicists idealize everything to the extreme, which could be why their most recent attempts to explain protein crystallization don’t quite work,” Charbonneau said. Scientists want to know the fundamentals of protein crystallization because proteins are essential for living creatures to survive. Proteins come in many different shapes and have a variety of functions, and their structures explain how they interact with other molecules in the human body — information that often leads to more targeted medications. To study protein shape, scientists precipitate them from liquid solutions into crystals, which is how DNA’s double helix structure was revealed. Physicists have also tried to model protein shape through computer simulations. In Charbonneau’s new model, he combines physicists’ past simulations based on the spherical cow model with the best protein-crystal-making insights from structural biology. The new hybrid is what Charbonneau calls the patchy cow model. To develop it, he and his students digitally recreated the structure of the protein rubredoxin as a spherical cow, making it resemble a basic blob-like molecule. The team then applied patchy areas, which acted like the atomic interactions shaping the structure of a protein. “We found the model actually works, giving us a patchy picture that does predict some of the crystal structure of proteins,” Charbonneau said. It is the first time a simulated model of protein crystallization has matched well with the temperature, salinity and other crystal-forming conditions structural biologists observe in the lab. And “it’s the first time that we can draw clear physical insights from how the model compares with experiments,” he added. Charbonneau first began working on the protein crystallization problem as a post-doc at Amolf in the Netherlands. When he came to Duke in 2008, he met David and Jane Richardson — leaders in the field of protein crystallization and structural biology. From them, Charbonneau began to realize that physicists and structural biologists don’t know each other’s work. “We don’t cite each other, and we don’t trust each others’ descriptions of protein crystallization,” he said. The goal of his work, he explained, is to convince the disciplines to begin talking to each other. The biggest problem for both camps is that they know the atomic and molecular interactions that should be involved in crystallizing a protein, but they “cannot make sense of what is going on. It’s figuring out the mechanism, the physical process, that is frustrating,” Charbonneau said. His new model tries to paint the physicists’ spherical cows from the perspective of the observations the Richardsons and others have already made in the crystallography community. Charbonneau anticipates that the patchy spherical cow model might help structural biologists predict what conditions they need to crystallize any protein of their choice. But first, he said, the team needs to put their model to another test, simulating crystallization in more complex proteins, such as physicists’ favorite, lysozyme. 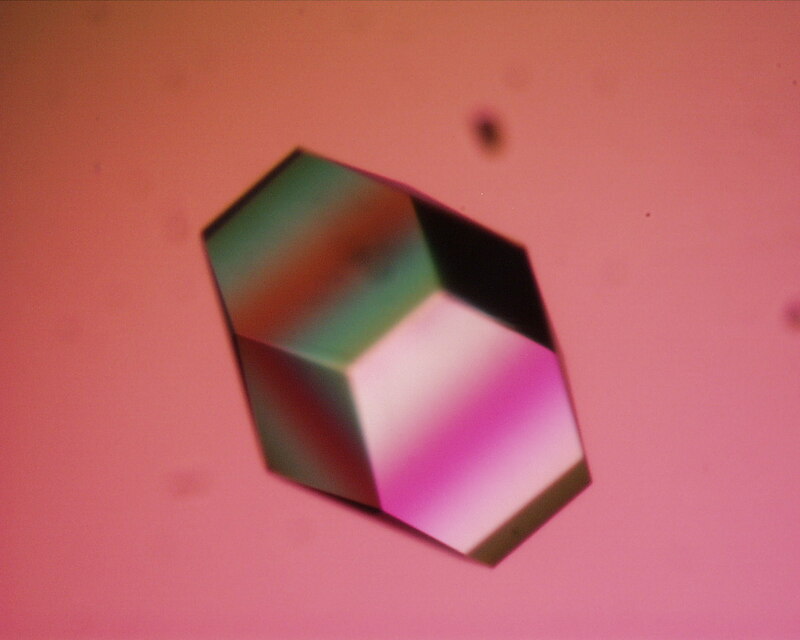 Citation: “Characterizing protein crystal contacts and their role in crystallization: rubredoxin as a case study,” Diana Fusco, Jeffrey Headd, Alfonso De Simone, Jun Wang, and Patrick Charbonneau. Soft Matter, November 8, 2013. 10.1039/C3SM52175C. 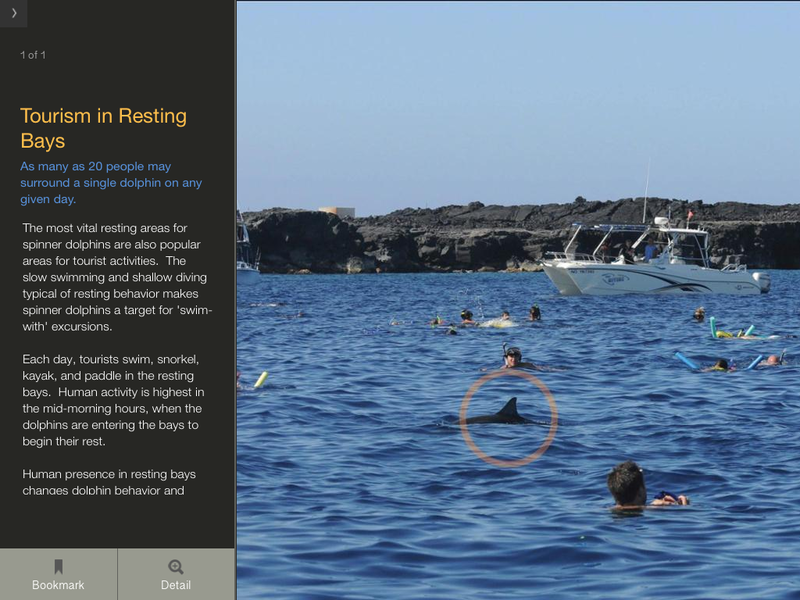 A screenshot from a new app, the Nai’a Guide, which provide info about eco-friendly dolphin-watching tours in Hawai’i. Credit: Demi Fox, Lenfest. Traveling to Hawai’i sometime soon? If so, you’re probably excited to experience spinner dolphins in the wild. If not, you can still dream about it. And now, there’s an app for that. Scientists at Duke’s Marine Lab in Beaufort, N.C. have released the Nai’a Guide — a new iPad app that teaches users about wild Hawai’i spinner dolphins and how to see the animals without harming them. Tourists can use the app to plan an eco-friendly tour to experience the dolphins. “If we can harness the power presented by mobile technology for conservation and responsible tourism, we have the chance to reach a wide audience and really make a difference for these animals,” says Demi Fox, a postgraduate researcher at the Lenfest Ocean Program who developed the app, along with Duke marine biologist Dave Johnston. Nai’a is the Hawaiian word for dolphin. The Nai’a Guide explores the biology and ecology of spinner dolphins with photos, videos and sound clips. It also describes sustainable dolphin-based tourism practices outlined NOAA’s Dolphin SMART program. 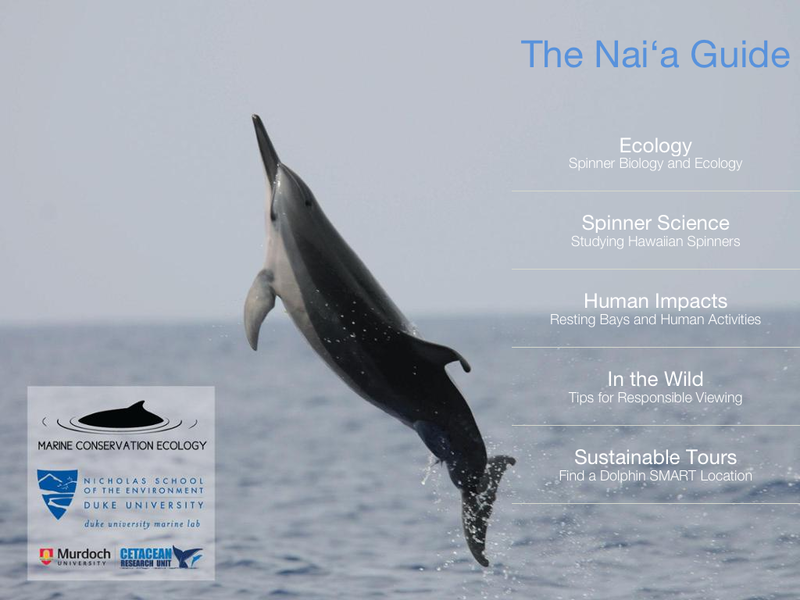 With the Nai’a Guide, users can learn about spinner dolphins and their habits. Credit: Demi Fox, Lenfest. Designed by Fox and developed by an online company called Kleverbeast, the Nai’a Guide also connects tourists with sustainable tour operators so everyone can make more responsible decisions when going to see spinners. “The principles advocated within the Naia Guide could also be useful for dolphin-based tourism in other places, and with other species. Many of these best practices are generalizable,” Johnston says. He and other scientists are concerned about human interaction with wild dolphins and other species worldwide. In Hawai’i, the main concern is that spinner dolphins rest during the day in the same shallow bays that people use for snorkeling, kayaking and swimming. Many tourists misinterpret the dolphins’ close proximity and curiosity for playfulness and try to swim with and even ride the animals while they are sleeping. Intense and consistent human interactions could affect the dolphins’ health over time, Johnston says. The negative effects may also threaten the animals, a resource the state uses to draw tourists to the islands. As a result, he and colleagues at Murdoch University’s Cetacean Research Unit have been tracking spinner populations and monitoring their interaction with people in the Hawai’i island bays. 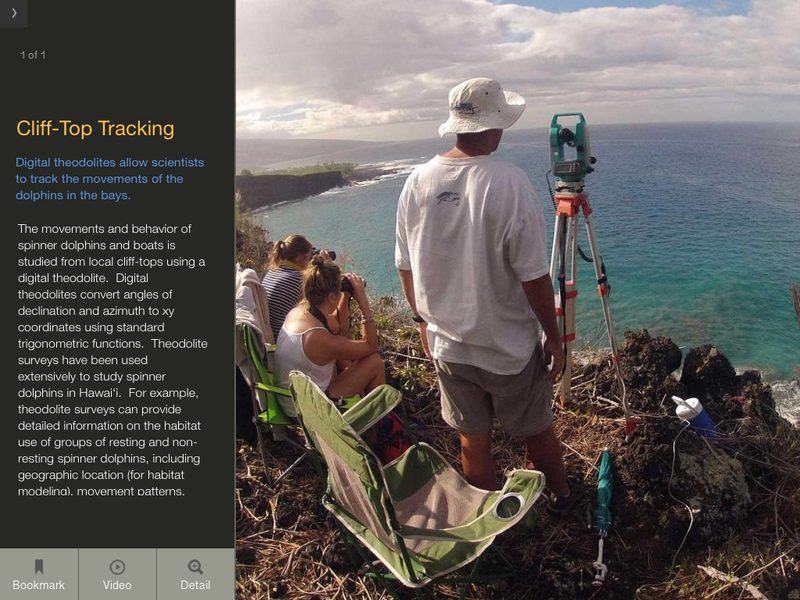 Researchers study dolphins in boats and high on the cliffs of Hawai’i Island, which is covered in the new app. Credit: Demi Fox, Lenfest. Scientists “can do all the science in the world, but until we share our findings broadly and in an accessible way, we will not effect serious change,” Fox says. She included the team’s research in the app so users can better understand researchers’ concerns about human-dolphin interactions and can make more informed decisions when choosing a dolphin tour. “My hope is that the app will serve as an ecological conscience,” she says. The app, available in Apple’s iTunes Store, can also be found on Twitter @NaiaGuide and on its website, http://www.naiaguide.org. This juvenile male grey seal swam up onto a North Carolina beach recently, surprising locals. Image courtesy of: StarNews Online. On May 23, visitors to Carolina Beach met an unexpected guest — a male grey seal. The 300-plus-pound juvenile was somewhat of a surprise to North Carolinians, since his typical habitat ranges from the coastal waters of Canada and extend south to about New Jersey. It is the first time a grey seal has been seen as far south as the Carolinas. But the seal’s southern swim wasn’t too surprising to Duke marine biologist Dave Johnston. 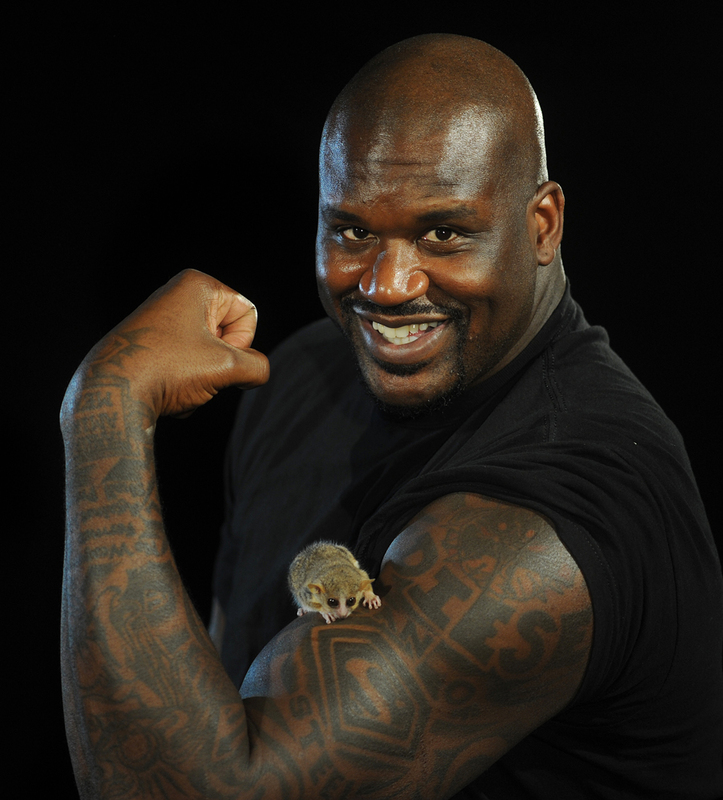 “Things have been weird with seals for the last ten years or so. We’ve been seeing more harp, hooded and grey seals much farther south, usually the males,” he says. To track seals’ travel patterns, Johnston and his colleagues have started attaching cell-phone enabled GPS tags to the animals in the Cape Cod region. They tagged their first grey seal, Bronx, last summer and from his transmissions alone have learned where the creatures like to hang out, how deep they can dive and just how far they can swim. Bronx has covered the equivalent of the land area of Massachusetts and Connecticut combined during his swims. He’s explored below the ocean depths nearly 900 feet — a little more than a tenth of a mile, and he’s even made an international trip, crossing into Canadian waters. But Bronx swims mostly in the waters near Cape Cod and Nantucket Islands, Johnston says. Grey seals like Bronx have had a rough history in the region. In the 1800s, humans hunted and killed the entire population living in the Gulf of Maine. For a long time, there were few or no sightings of the animals. But since 1972, grey seals have been protected under the Marine Mammal Protection Act and are now returning in larger numbers to the shores of what was once their native habitat. This map shows where a GPS tagged seal, Bronx, has swum since last summer. Image courtesy of Dave Johnston, Duke. Some Cape Cod locals aren’t too happy about that. The seals come ashore in large groups, disrupting beach access in certain areas, and they leave behind their waste. They get caught up with fishermen’s gear and try to steal their catch, and the seals aren’t the friendliest marine mammals. “People like dolphins. They tend not to like seals as much,” Johnston says, explaining that grey seals are smart, excellent predators and can be aggressive towards humans. “They can be loud and obnoxious, and they will bite,” he says. That’s a challenge for both the seals and residents of the Cape Cod. 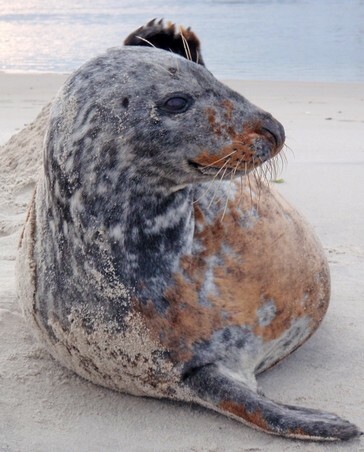 Part of the tagging effort is to increase people’s understanding of how grey seals interact with the ocean environment surrounding Cape Cod, and it could possibly explain why some of the animals are swimming as far south as the Carolinas. 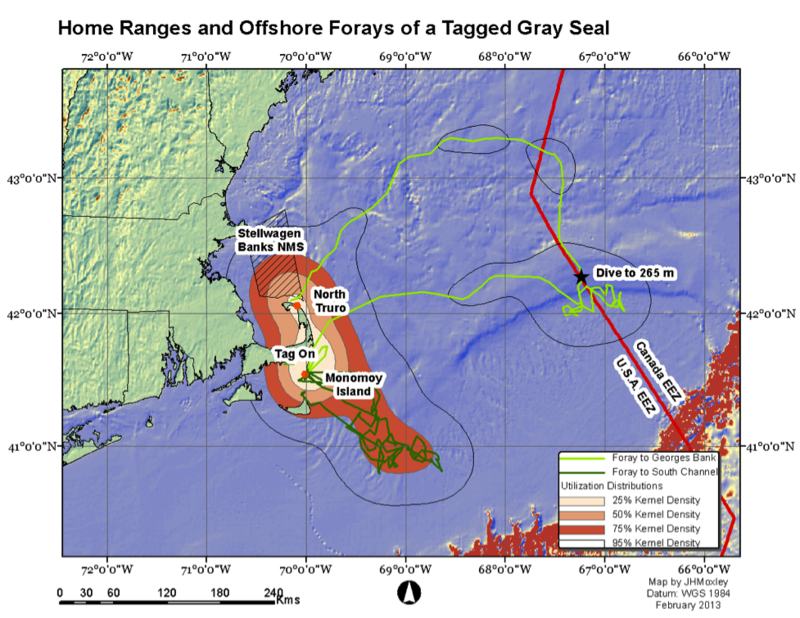 The team is heading to the Cape Cod in early June to attach tags to seven more grey seals. The goal is ultimately to use the tracking data to improve the relationship between humans and seals there, Johnston says. 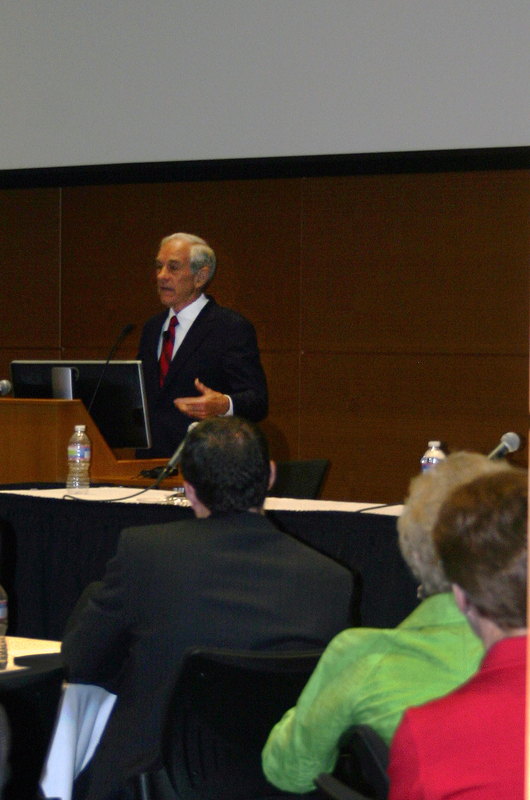 Former presidential candidate Ron Paul, an MD from Duke Medical School, speaks at the 2013 Feagin Leadership Forum. Credit: Ashley Yeager, Duke. Credibility is key for becoming a leader, both basketball coach Mike Krzyzewski and former politician Ron Paul told a group of Duke medical school students on May 18. The two spoke as part of the Duke Sports Medicine Feagin Leadership Forum, a weekend meeting focused on ethical leadership. He, along with Paul and the other speakers and panelists, told the audience anecdotes where they had to choose to be ethical despite the decision not being the easiest or the most favorable among their peers. Joanne Kurtzberg, a specialist working with children’s blood disorders, explained her difficult decision to send a patient to Europe for treatment using umbilical cord blood. The procedure was life-saving but had not yet been approved by the FDA in the U.S. The decision and Kurtzberg’s pioneering effort in umbilical cord banking and treatments earned her what Krzyzewski called “street cred.” He said those looking to lead should be in constant search of credibility from their peers because it is one of the most important ways to show a person is willing to what is hard and difficult but the right thing to do. While the audience was a mix of military, business and medical leaders, Krzyzewski tailored his speech mainly to the 2013 Feagin Medical Scholars, 16 medical school students who receive additional training in moral and ethical leadership, public speaking and other skills to make them well-rounded doctors. This program, he added, can take ethical leadership in medicine to a level no one has reached before, making it the gold standard, not only in the U.S., but also worldwide. 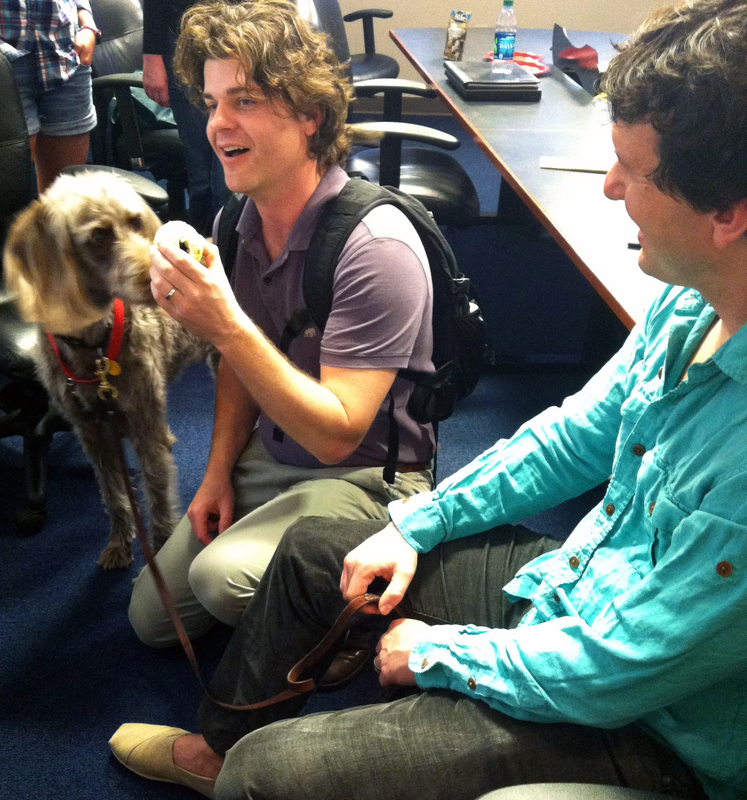 Brian Hare and Evan MacLean, co-directors of Duke’s Canine Cognition Center, play with Lilu, a labradoodle. Credit: Ashley Yeager, Duke. Lilu, a beautiful brown poodle-labradoodle mix, couldn’t sit still. Scents of pizza and peanut butter dog treats and the sights of new people easily distracted her. The ADD behavior could be one trait that made her fail out of service-dog training. “Six out of every ten dogs wash out of service training. But it’s hard right now for scientists to understand why,” said Duke evolutionary anthropologist Evan MacLean, co-director of the university’s Canine Cognition Center. He, along with biological anthropologist Brian Hare and geneticist Misha Angrist spoke about ‘Genes, Brains and Games’ in man’s best friend as part of the Science and Society Journal Club on April 26. MacLean and Hare explained that dogs have taken on many jobs in human society, acting as everything from pets, to our eyes and ears to being like coal-mine canaries searching for hidden bombs and missing people. “Dog vocations require different sets of cognitive skills,” MacLean said. He studies military dogs, looking for traits that make them more suited for service tasks than pets like Lilu. MacLean would ultimately like to identify the genetic components that underlie the characteristics suited for each type of job that a dog might do. Scientists are interested in correlating dogs’ cognitive traits to their associated genes because the animals are “the most exquisite example of artificial selection,” Angrist said. In Portuguese water dogs, for example, just six substitutions in individual DNA bases of the dogs explain variations in body size. In humans, nearly every gene could factor into height. It’s the same challenge that makes understanding human cognition and intelligence difficult at the genetic level. Of course, defining cognition and intelligence at the conceptual level isn’t so clear cut either. “It’s so hard for people, journalists and the general public, to understand multiple intelligences,” Hare said. He explained that at a basic level, cognition is the ability to make inferences, and that when we think of intelligence we think of IQ and standardized tests. These tests, however, measure only one type of intelligence. They don’t measure the ability to empathize, to verbalize a new idea or to put two completely separate ideas together to form a new one, which are other, important facets of intelligence, or really multiple intelligences. At the Canine Cognition Center, and through the citizen science website Dognition, Hare and MacLean use standardized tests to study the variation in dogs’ intelligence. The tests, unlike the SAT or ACT, “cast a wide net across skills sets dogs could use for different vocations,” Hare said. Dogs like Lilu, he added, are “really the hope of the world” for understanding cognition. This screenshot shows one of the opening pages of a chapter in Johnston’s new iBook. Image courtesy of Dave Johnston, Duke. Duke marine biologist Dave Johnston and his students are back in business on iTunes. They’ve just released The View From Below, a free iBook for middle school students and teachers that uses multimedia and classroom exercises to discuss overfishing, marine debris, climate change, invasive species and other issues related to marine conservation. This is Johnston’s second digital textbook. His first was Cachalot, an iPad textbook covering the latest science of marine mammals like whales, dolphins and seals. Experts contributed the text, images and open-access papers. The View From Below, however, is a bit different. 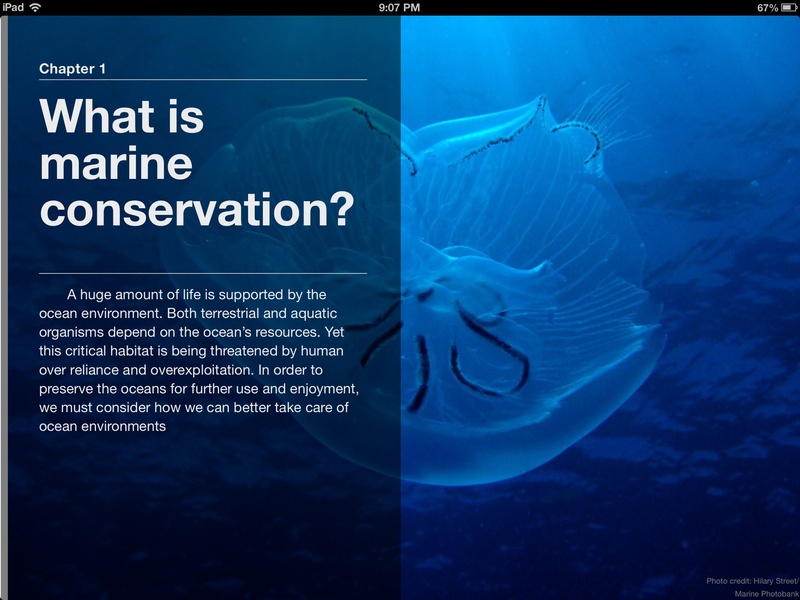 Undergraduate students in Johnston’s Marine Conservation Service Learning class wrote the book using Apple’s iBooks authoring tool. Johnston and Tom Schultz, Director of the Marine Conservation Molecular Facility at Duke’s Marine Lab, edited it. Johnston says the class chose to use the iBooks software because the technology is free, easy to use and provides “great templates to get things going quickly.” The software also works well because Duke’s Marine Lab has an iPad loaner program, making the tablet the platform of choice for developing and testing the textbook. The middle school that the service learning class works with also has access to iPads for students and instructors, so the audience was there for the iPad format, Johnston adds. His students chose to write the book as the class project to spur learning and discussion about some of the most serious problems facing Earth’s oceans. “As the text indicates, all life on earth is ultimately supported by the ocean, so we need to take care of it,” he says. This is the final post in a four-part, monthly series that gives readers recipes to try in their kitchens and learn a little chemistry and physics along the way. Read the first post here and the second one here and the third one here. This bunny must have been made from quality chocolate. His ears are already gone. Credit: Waponi, Flickr. When you snap off and savor the ears of a chocolate bunny this Sunday, say a quick thanks to science. “The essence of science is to make good chocolate,” said Patrick Charbonneau, a professor of chemistry and physics at Duke. He explained that cocoa butter, one of the main ingredients in chocolate, can harden into six different types of crystals. All six types are made of the same molecules. But, at the microscopic level, the types have distinct molecular arrangements, which lead to differences in the crystals that form. “The problem with chocolate is that only two of these types have good texture when eaten,” Charbonneau told students in the Chemistry and Physics of Cooking. He teaches the freshman seminar with chef Justine de Valicourt and chemistry graduate students Mary Jane Simpson and Keely Glass. During class, students looked at and tasted chocolate containing only the good-tasting crystal types and some that also contained the less favorable ones. The first had that signature sheen and snap of quality chocolate and melted evenly when left on the tongue. The latter pieces were dull, melted with the slightest touch and left a sandy texture on the tongue. The demonstration showed that the different types of chocolate crystals melt at different temperatures. By carefully controlling the chocolate as it cools, chocolate-makers can create mixtures of only the favorable crystal types. The process, called tempering, takes chocolate through a series of heating and cooling steps. The initial cooling step forms many of the chocolate crystal types, including the dull, unfavorable ones. Warming the mixture a little — to about 31°C (87°F) — melts the unfavorable crystals but not the best-tasting ones. As the mixture cools again, the remaining, favorable crystals “seed” the chocolate so that good-tasting crystals form preferentially throughout, ensuring good chocolate structure and taste. Students got a chance to test the science in lab later that evening, and judging by the number of mouths (and faces) covered with chocolate, it’s safe to say the science was successful. If you’re looking to try it out — or save a poor bunny’s ears — here’s the recipe. 1. Place milk or dark chocolate in the small bowl. 2. Heat the bowl in 30-second intervals in a microwave (stirring after each) until the chocolate is melted. Note: The milk chocolate should take about 1.5 minutes and the dark chocolate about 2 minutes to melt. 4. Spread the pancake portion out in ribbons using the scraper spatula. Bring the chocolate back together into a mound repeatedly for 5 minutes, until it starts to solidify. 5. Put the chocolate back in the original heating bowl. Adding the cooler chocolate will cool the rest of the liquid to the right temperature. 6. Mix the cold and hot chocolate. 7. Check the temperature of the chocolate. (Dark: 31-32°C/88-89.5°F; Milk: 29-30°C/84-86°F). 8. Dip the parchment paper in the mixture of the “hot” and “cold” chocolate. If it cools on the parchment paper and is uniform and shiny, then it’s ready. 9. Pour chocolate into mold. 10. To make stuffed chocolate candies, flip the mold to empty excess chocolate. 11. Turn it back, scrap the excess of chocolate off the surface. Let the thin layer of chocolate in the mold crystallize. 11. Melt white chocolate. Mix it with yogurt. Cool to room temperature. 12. Add filling to 2/3 of the mold cavities, and then pour more tempered chocolate on top. 13. Level the chocolate with a scraper and scrape off excess. 14. Let it rest for few minutes at 20°C (68°F) or put it in the fridge. 15. Pop candies from mold and enjoy. A few mathematicians made their NCAA bracket based on the quality of universities’ math departments. Courtesy of: Jordan Ellenberg, UW-Madison. If NCAA basketball championships were won with math, Duke would move on to the Final Four. At least, that’s what Jordan Ellenberg, a University of Wisconsin mathematician, and his friends think. They didn’t use complex algorithms to make their bracket, but picked their winners based on the quality of each school’s math department. With that ranking scheme, Harvard would win it all, with Cal second and UCLA and Duke rounding out the Final Four. “Of course, these judgments are for entertainment only, and were produced by a group, so if you find any of the picks absurdly wrong, those were the ones I didn’t make,” Ellenberg wrote on his blog, where he posted the picks. Sadly, the bracket isn’t doing so well as March Madness moves forward. But it is a fun way to learn more about the math departments around the country and how well their quality does, or does not, correlate with the quality of the schools’ basketball teams. 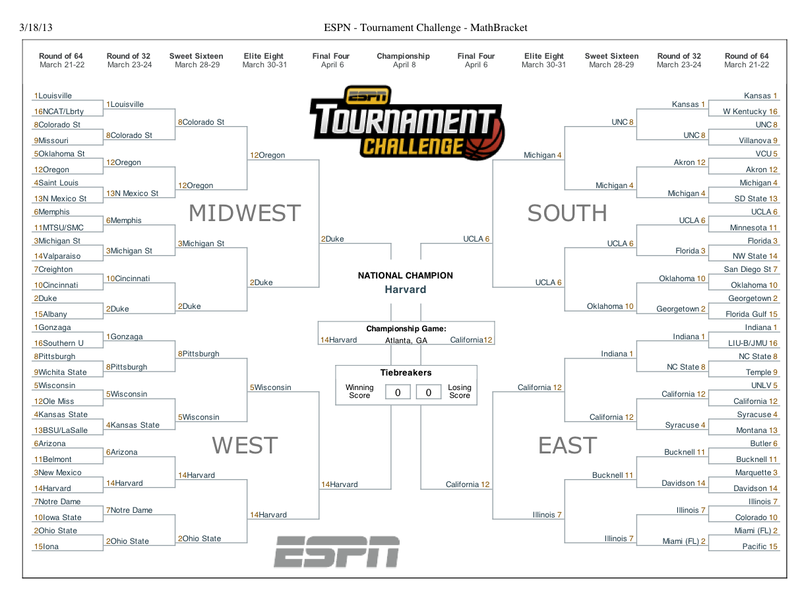 Special thanks to Duke mathematician Jonathan Mattingly for pointing the bracket out to us. 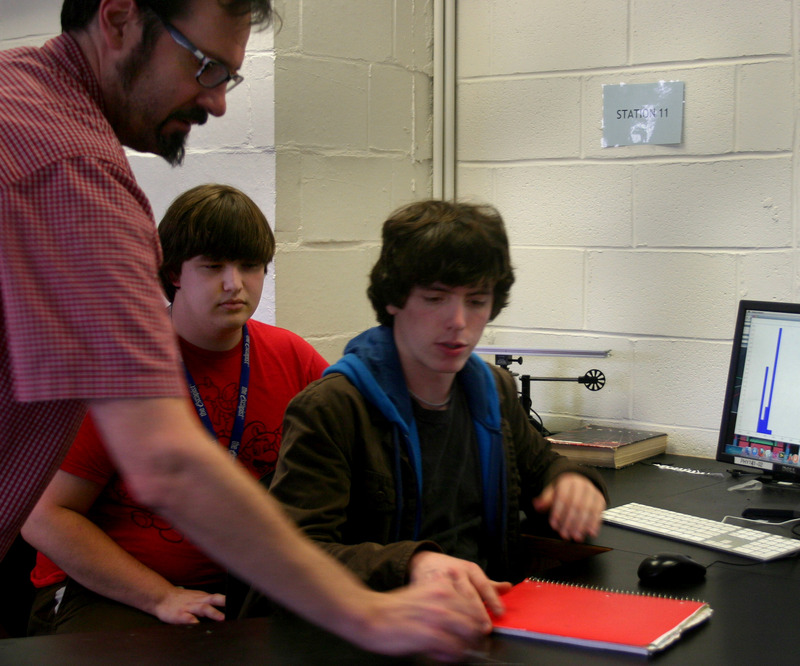 Duke physicist Mark Kruse explains finer points of analyzing LHC data to two NCSSM students. Credit: Ashley Yeager, Duke. Thin, blue lines spider across the computer screen. With a click on one, a solid blue peak on a bar graph pops up. A click on the other line makes a similar graph. Looking at them closely, two high-schoolers decide if they could be signatures of a particle called a Z-boson. The girls — physics students from the North Carolina School of Science and Mathematics (NCSSM) — log their analysis of the lines and move on to another set. They aren’t getting too excited about their possible Z-boson discovery yet because they still have 48 other sets of lines, or events, to analyze. Once they’ve worked through all the events, they’ll know if what they’ve seen could be due to a Z-boson decaying into pairs of electrons or muons. Kruse shared this insight with the two girls and a dozen other NCSSM high-schoolers during a Large Hadron Collider (LHC) Masterclass held at Duke on March 16. The European Particle Physics Outreach Group runs the masterclasses annually with help from university professors such as Kruse. This was the first time Duke hosted the program for local students. During the day, they got an introduction to particle physics and research at the LHC and an overview of ATLAS, the experiment Kruse and his collaborators use to search for Higgs bosons and other particles. Then, after a tour of Duke’s Free Electron Laser facility and a pizza lunch, the high-schoolers got their hands on real LHC data. They were looking mainly for events that showed possible remnants of a Z-boson. But a few Higgs-like candidates were thrown in too, which excited the students, Kruse and his two graduate students David Bjergaard and Kevin Finelli. The group may have even found a Higgs candidate in one of the first event analyses they looked at during the day. But, as with all discoveries, they had to take a closer look at their analyses and share their work with others. The group closed the day with a videoconference with high-schoolers in Medellin, Colombia who also went through an LHC masterclass at the same time. “This was an impressive group. They asked a lot of great questions, sparking some incredible discussion,” Kruse said. The questions — like, does anything make up a quark — are ones other audiences are perhaps too intimidated to ask because they might think it’s a silly question, he said. But it’s these questions that really get everyone thinking about the fundamentals of physics and how much scientists still don’t know, including if quarks can break down into anything smaller. This is in fact one of the many questions LHC scientists are trying to answer. Based on the success of the class, he is now thinking of running it again for physics students from other area high schools and possibly adapting it for journalists and policymakers. The goal is to illustrate to a wider audience the “gradual, cumulative nature of discovery” at the LHC, he said.